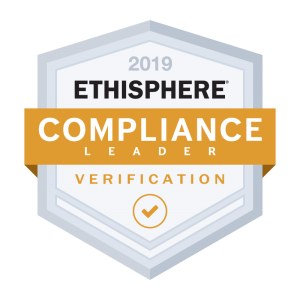 SNC-Lavalin is pleased to announce that it has earned the prestigious Compliance Leader Verification from the Ethisphere Institute, an independent centre for research, best practices and thought leadership. The Compliance Leader Verification is awarded exclusively to companies with the best industry ethics and compliance program that are proactively investing resources in compliance, sending a clear signal that an organization takes compliance and ethics seriously. This certification is valid until the end of 2020. Ethisphere completed a thorough assessment of SNC-Lavalin’s Integrity Program and benchmarked it against its 2018 World’s Most Ethical Companies data set, providing insight into the programs and practices of leading companies around the world. SNC-Lavalin’s performance was specifically evaluated on six main areas: program resources and structure, perceptions of ethical culture, written standards, training and communication, risk assessment, monitoring and auditing, enforcement, discipline and incentives. For further details, please visit www.snclavalin.com.